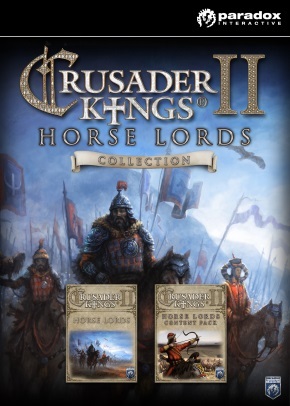 - Crusader Kings II: Horse Lords - it is the ninth biggest additions to the popular role-playing strategy game Crusader Kings II. - Mongol Unit Pack. This set consists of seven new models for the units unique to the Mongolian state. - Early Frankish, Early Germanic & Italian Unit Packs. These kits include unique model units for the early Frankish and Germanic tribes, as well as units for the Italian, Roman and Lombard peoples. - Cuman Portraits Packs. In this set includes thousands of unique combinations of entities for male and female characters from the Polovtsian nationalities. - Songs of the Steppes Music Pack. The kit includes musical compositions, performed during the game for any of the feudal lord of the steppe. Crusader Kings II: Horse Lords - it is the ninth biggest additions to the popular role-playing strategy game Crusader Kings II, dedicated to freestyle nomadic cultures of the Eurasian steppe. Supplement introduces new game systems and mechanics, such as new forms of governments, tributary state and an opportunity to build your empire on horseback. Your gains will require good funding - to establish trade links using the Great Silk Road, but be careful, other rulers definitely try to take control of the lucrative routes and enemy raiders destroy your trading positions, if you will not take out of defense. Can you build a Mongolian world and conquer Eurasia, uniting East and West under his rule and creating a new era of prosperity? Or, you will become a terrifying sword and crush all that will be on your way? It´s time again to play in history and become the Great Khan!